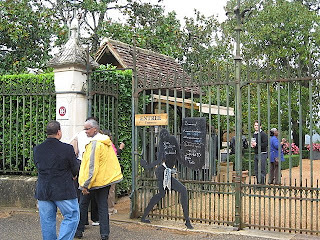 Spirit of Black Paris: Signs of Progress in Black France? Three weeks ago, I took this photo in Paris. It is scotch-taped to the door of a film production company, located in the 6th district. The 6th, for those unfamiliar, is an upper middle-class district, with the city's highest per square metre price of real estate. Its politics are centre-right leaning. And, to its great pride, it is home to many of the city's great cultural institutions (Institute of France, Faculty of Fine Arts, The Senate, to name a few). This cut-out felt like a little flag of hope waving (though the French do not wave flags of their own or any other except to mark official buildings or ceremonies). 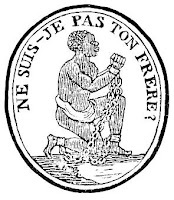 But one might say, oh it's Paris, they're cosmopolitan; they've got this admirable history of championing Blacks, right back to La Société des Amis des Noirs/Society of Friends of Blacks in Thomas Jefferson's day. The support for a Black candidate for the U.S. presidency stretches into the heartland. During a Colesville Travel/Walking The Spirit Tours visit to the Josephine Baker's chateau in the tradition southwest, the castle-owner herself was enthusiastically sure of Obama's win - bolstered, she said, by their media and the recent visit of the American ambassador. Cut to the country's Black population who want to believe this is possible, yet they seriously doubt this could ever happen chez eux (at home). A quick look at government representation tells a depressing tale: of 577 member of the National Assembly, there's not one face like theirs, except from the overseas territories. The most vocal of these, Mme Christiane Taubira, Deputy from Guyana, told the France Noire- Black France conference on June 6 http://history.berkeley.edu/faculty/Stovall/conference/ of her fight-to-the-death wish to become president of the French people, to represent all citizens, but her projects, plans and ideas are constantly ignored. She said, all who can must stand up. This France is not faithful to itself and its history, she adds. Or is it? Let's wind the tape back to Richard Wright's Paris, a time when African intellectuals were being groomed in the top French management school to benefit their independence-seeking countries. Fundamental historical relations to France colored the outlook of Diaspora activists Aimé Césaire, Leopold Senghor and Wright. None of them agreed on how Blacks and France should and could formulate a working relationship. It was easier, then as now, for the French to support American Blacks because their fight wasn't/isn't taking place on French soil. Would any of the three applaud (progress) in France today? Perhaps it’s a trickle up method. On an everyday level, to me, having lived in Paris and Provence for many years, and noted the lack of black representation in the common spaces, I have noticed in recent times, more faces of colour where there were absolutely none. On transatlantic Air France - brown flight attendants, in finer cafés where Monsieur le serveur is trained and diploma'd in the art of service - black servers, and…. 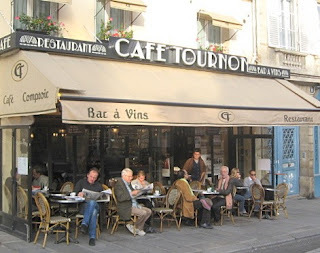 in Richard Wright's old café near The Senate, Le Tournon, the first Black behind the counter I've ever seen. It does seem a contradiction in the progress of race relations between France and the United States. France is further behind in the integration of Blacks into government while America has just elected a Black President. One would have expected that France would have been ahead of the United States in obtaining equality of the races. In the USA there are still strong holds of racism, which can be seen in headlines today, which a court through out a suit claiming the Obama is not a US citizen due to the face that both parents were not citizens (a requirement that has never been part of the law). It is a mark of cultural shift that the extreme politics of the past 8 years in the US have led to this dramatic change. Maybe there will be a time when a similar swing of the political pendulum will cause France to be more open to the actual election of "people of color" to their government. Current actions in the USA do seem a contradiction in the progress of race relations between France and the United States. 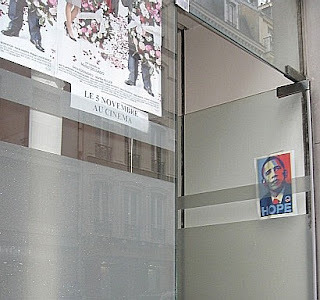 France is further behind in the integration of Blacks into government while America has just elected a Black President. One would have expected that France would have been ahead of the United States in obtaining equality of the races. In the USA there are still strong holds of racism, which can be seen in headlines today, which a court threw out a suit claiming the Obama is not a US citizen due to the fact that both parents were not citizens (a requirement that has never been part of the law). 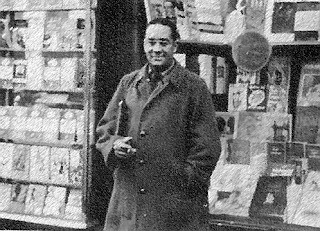 Maybe it will take an American Black in Paris to wake up the Frence as to the potential of ALL BLACKS to the Frence people (remember Josephine Baker!). So right you are, Walter. And thank you for your comments. Up to now, the French have felt superior to America, while at the same time admirative of her forward-thinkingness except when it came to treatment of Blacks. The French as an institution is still somewhat resistant to this change among their own Black population but where culture shift comes into play, it seems to me, is in certain people like Sarkozy's wife and her declarations and push power. And, not wanting to look backward, as the French are absolutely horrified of, they will and have started talking of their own shifts. It is such a proud moment for African-America to generate this earthquake of a global change. And that's been our history all along - through jazz, through Josephine's activism, through the writings of Wright and Baldwin. And we continue on! WalterB: Sorry to be a bit off-topic, but I'm not familiar with any court decision challenging Obama's citizenship. Can you provide a news article or a cite to it? Obama's mother was certainly a US citizen, her roots in the US go back to colonial times. And even if she were not, Obama would be a citizen by virtue of having been born in Hawaii. My parents were not US citizens when I was born, but I was a US citizen from the moment of my first breath in Chicago.